When a basement wall begins to fail, the first sign is typically cracks in the block or cracks in the mortar. Basement wall cracks usually run horizontally along the wall near its mid-height. A basement wall crack is rarely cosmetic; you may have serious foundation problems. Basement walls fail for a variety of reasons. The most common is too much lateral pressure from the earth outside. Wall damage can be accelerated by poor drainage or plumbing leaks. In some cases, the wall construction is inadequate to withstand normal lateral pressure pushing against the wall. A foundation inspection can identify the source of basement wall cracks in your home. Repairing a basement wall is rarely a DIY project. It’s best to let a foundation contractor repair the wall and fix the underlying foundation problem. The two most common repairs for bowing basement walls are Carbon Fiber Reinforcing and Tiebacks. To restrain a basement wall from bowing, carbon fiber straps are attached to the wall with epoxy, top to bottom. 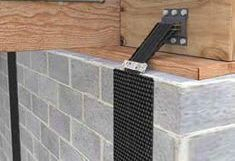 Carbon fiber reinforcing straps are very cost effective basement wall repair and can be applied quickly with little disturbance. If a basement wall is leaning significantly, a tieback system may be used. Common tieback systems include helical, grouted, drilled, and driven tiebacks. Tiebacks are installed through the wall and into the soil strata behind the wall to create a secure anchor. The tiebacks are then attached to a plate or whaler system installed on the face of the wall to prevent further bowing or leaning.